The holiday season is now in full swing, and many U.S. cities are decked out with annual festivals of lights, elaborate tree displays and Christmas markets. If you love the season's carols in addition to evergreens and lights, Portland hosts the largest Christmas choral festival in the world. 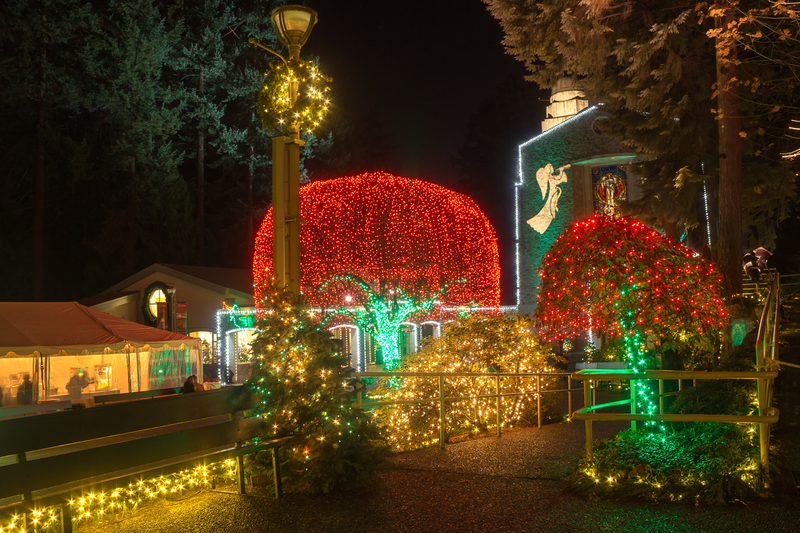 The Christmas Festival of Lights at the Grotto fills the majestic fir trees of the city's Catholic sanctuary and botanical garden with soaring lighting displays. The event features over 170 indoor holiday concerts, as well as puppet shows and a live petting zoo to please the whole family. The event runs through December 30, so there's still time to book some last-minute holiday travel. You'll find the festival situated in close proximity to the rest of Portland's quirky charm. And the city's trending food cart, brewery and Scandinavian food scenes may hit the spot for a Pacific Northwest holiday getaway. Using travel site Skyscanner, we've sifted through the cheapest flights between Harrisburg and Portland, including some standout hotel options and other highly reviewed local attractions. The cheapest flights between Harrisburg and Portland are if you leave on December 20 and return from Oregon on December 26. Alaska Airlines currently has roundtrip, nonstop tickets for $807. To plan your stay, here are some of Portland's top-rated hotels, according to Skyscanner, that we selected based on price, proximity to things to do and customer satisfaction. For an all-around top recommendation, consider The Kimpton Hotel Vintage Portland. The hotel has a 4.9-star rating on Skyscanner, and rooms are currently available for $139. If you're looking to splurge on top quality, there's The Lion and the Rose Victorian B&B Inn. Rooms are currently set at $155/night. The Lion and Rose has six rooms and a meeting/reception space that can accommodate up to 75 people. All rooms have TVs, telephones, air-conditioning and Wi-Fi. It's conveniently located in the historic Irvington neighborhood, near the Lloyd Center, the Oregon Convention Center and downtown Portland. A third option is Hotel deLuxe. With a 4.5-star rating on Skyscanner, the hotel is one of the most luxurious in the city. Rooms are currently listed for $129/night. Hotel deLuxe is a glamorous downtown Portland hotel that pays homage to the Golden Era of Hollywood. All of the hotel's design and detailing is inspired by the architectural and decorative arts of the 1920s through the 1940s. Don't miss Portland's food scene, with plenty of popular spots to get your fill of local cuisine. Here are a few of the top-rated eateries from Skyscanner's listings. If you're looking for a local favorite, head to Voodoo Doughnut, which has an average of 4.1 stars out of 228 reviews on Skyscanner. "Short line and easy service," wrote visitor Briana. "Remember this is cash only when you go. Would go again." Another popular dining destination is Food Carts All Over Portland, with 4.6 stars from 85 reviews. "You've got pretty much any kind of food you might want in a convenient location. I've tried many of these and have never been disappointed," wrote reviewer Barbara. Also worth considering is Pine State Biscuits. Pine State Biscuits launched its kitchen at the bustling Portland Farmers Market in spring of 2006. Word caught on about the outdoor baking operation and in early 2008, the owners opened up a small biscuit shop on Belmont Avenue, where folks can enjoy a wholesome breakfast or lunch seven days a week, rain or shine. To round out your trip, Portland offers plenty of popular attractions worth visiting. Here are some top recommendations, based on Skyscanner's descriptions and reviews. First up is Powell's City of Books. Powell's City of Books is a book lover's paradise and the largest used and new bookstore in the world. Located downtown and occupying an entire city block, the store stocks more than a million new and used books. "It's a modern-day shrine to all things literature. If you're a book junkie, you can kill a week in there and find a hidden gem each time," wrote visitor Stephen. Then, there's the Portland Japanese Garden. The Japanese Garden in Portland is a favorite among locals and tourists. Take a stroll through the five gardens, each distinct in its own style and beauty. Enjoy nature at its best as the serene and tranquil surroundings take you to a place of peace and harmony, with waterfalls whispering in the background and koi swimming and playing in the pond.